Because you deserve something a bit extraordinary. You must have an account with PayPal in order to apply for a PayPal Extras Mastercard account. When you click “Apply Now”, you will be prompted to log in PayPal. If you do not currently have an account with PayPal, you will need to open one to apply. Get more of the good stuff. Simply shop, earn Reward Points*, and redeem for gift cards, merchandise, travel vouchers and cash back into your PayPal balance**. It’s really that easy and awesome. You can relax & enjoy. You're getting Mastercard benefits. Double the original manufacturer's or store brand warranty for up to one year when you purchase using your PayPal Extras Mastercard. You’ll get ID theft alerts, credit card replacement and ID Theft Affidavit assistance if you’re the victim of identity theft — at no cost to you. Finally, the rewards and benefits you deserve. 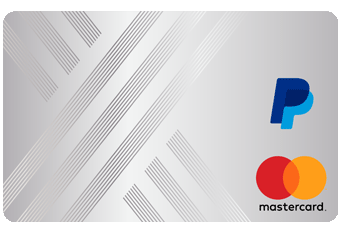 Apply for the PayPal Extras Mastercard now. You must have an account with PayPal in order to apply for a PayPal Extras Mastercard account. When you click “Apply Now,” you will be prompted to log in PayPal. If you do not currently have an account with PayPal, you will need to open one to apply. *Purchases subject to credit approval. Accrued Reward Points that are not redeemed will be forfeited 24 months (2 years) after they were first accrued or if there are no purchases for 24 consecutive months. See Rewards Program Terms for details and other reasons why accrued Reward Points may be forfeited. Note: Without an active account with PayPal to which your Card is linked, you will not be able to (1) use the Card to make purchases through PayPal; (2) earn rewards on PayPal purchases; (3) redeem rewards online or in a form other than statement credit; and (4) take advantage of online account management, make payments online or receive online statements. You will only be able to redeem rewards in the form of a statement credit by calling the number on the back of your card.